Save Your Time and Hard Earned Money!
? maybe someone else told you it’s not repairable but you would like a 2nd opinion?
? not sure if something can be repaired – no question is a dumb question – just call us and ask! Being Australia’s best value handpiece repair service with over 20 years of professional industry experience we understand how important it is to keep your surgery running to its full potential while keeping costs down. The last thing you and your practice want are repair bills that are expensive and handpieces that continue to break-down. That’s why we offer an exclusive 100% FREE dental handpiece health check. We test and analyse your handpieces to ensure your practice is getting the best value for money out of your handpieces. That’ s right, 100% FREE dental handpiece health checks. An offer to good to miss out on. More than that, we’ll check all of your handpieces, motors, couplings, ultrasonic scalers, triplex for FREE too. Simple. 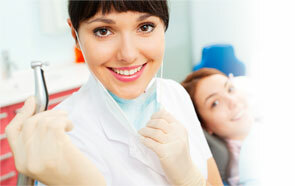 We’re Australia’s best value dental handpiece service and repair centre for 20 years and we plan to stay the best. Over the years we’ve seen many people enter and then leave the industry. Then there are dental consumable goods sellers that try to attach a handpiece repair service with little knowledge and professional training with a focus to up-sell you new handpieces. And lately we’ve seen an increase in repair services done in the ‘back of a van’ with limited repair training, testing and analysis equipment. Our professional and specialised repair centre is fully equipped with OEM testing and tooling equipment and all the manufacturers specified parts. This enables us to be your one stop professional handpiece repair centre without needing to sending your handpieces to different repairers. With our service you can send all of your handpieces to the one place saving you time and money – completely headache free. What’s the difference between us and the other handpiece repairers? GET 100% OBLIGATION FREE QUOTE/ESTIMATE to ensure you’re getting the best value handpiece repair service! If you find a better value dental handpiece repair service just let us know and we’ll beat it – guaranteed! Just call us on 1300 101 404 to arrange FREE courier pick-up or send us your dental and lab handpieces by Australia Post and start saving today. 1. 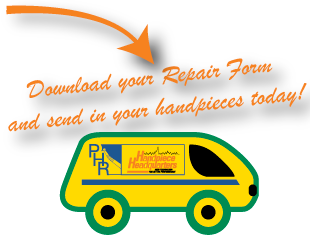 Click here to download our form to send in you handpieces today for free.